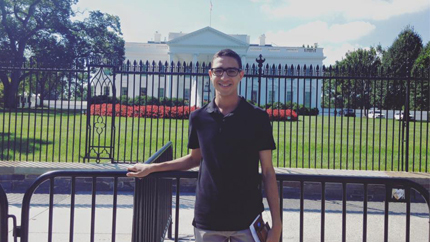 Mohamed El Amrani poses in front of the White House during his IVLP. The Spanish airliner Vueling has named one Airbus 320 after Mohamed El Amrani, a 23 year-old social activist, entrepreneur, and communicator from the Spanish northern town of Roses, two hours from Barcelona, who in 2009 founded a unique organization to identify the problems Muslim youth in his community were encountering and to find a way to resolve them. The Vueling campaign’s moto is “Stories that Deserve an Airplane.” By dedicating some of their airplanes to what they call “anonymous heroes,” the airliner intends to amplify success stories and positive initiatives which often go unnoticed. Mohammed El Amrani is an alumnus of the International Visitor Leadership Program (IVLP), nominated by the U.S. Consulate General in Barcelona to participate in the “Engaging Youth Leaders in Strengthening Communities” program in September 2015. Mohammed later described his program as an eye-opening experience. The IVLP allowed him to see how the United States treats diversity and multiculturalism; how grassroots organizations and government agencies work to promote co-existence and tolerance and counter extremists’ efforts to radicalize and recruit; and learned about the role of volunteerism in social activism. El Amrani is a role model for many Muslim youth and also for other youth with immigrant backgrounds in Spain. Born to a Moroccan family, he arrived in the village of Roses at the age of 3. Winning a literary prize at the age of 13 made him realize how by telling stories, one could influence people. When he was 17, he founded Xarxa de Convivència (Coexistence Network), one of the rare non-religious NGOs run by a Muslim in the region. The organization develops programs for youth and works closely with local authorities, other civic organizations, and the community to promote co-existence and to effectively lead youth at risk of social exclusion to find their way in society. El Amrani’s innovative approach involves youth of all ages, works to reinforce their identity or dual identities, and empowers them, while having them contribute to society at the same time that they receive assistance. The success of his NGO and personal commitment to social co-existence in his town have earned him several awards, including the European University of Madrid and International Youth Foundation Award to a Young Social Entrepreneur (2013) and the Prince of Girona Award (2014) in the area of social issues. He has also been recognized as a Global Shaper by the World Economic Forum (2015) and has been a TEDx speaker. He is also a frequent contributor to regional and local media outlets. Mohamed is extremely happy with Vueling’s "El Amrani Bus," but he also points out that this airplane is a tribute to all the people who have supported him and made it possible for his projects and ideas to become a reality.